Fortunately with this daguerreotype, the alkaline silicates from cover glass decomposition were limited to the underside of the glass and did not transfer to the plate in form of mold-like accretions. Glass decomposition, sometimes called "weeping glass" occurs with excess humidity and in the most state, the damage can migrate to the surface. When relative humidity drops below 42%, the sticky alkaline byproducts of glass decomposition crystallize, as in this example. The original cover glass was replaced with low-iron 3mm glass. Low-iron glass is clear, without the green tint of standard framing glass which is preferable to preserve the visual qualities and tonal beauty of the image it protects. This is an example of a reverse paint passé-partout cover glass for a French stereo-view. When the cover glass deteriorates it fractures and displaces the dried aspaltum, the typical blacking material for reverse painted glass. New cover glasses are made with thin low-iron glass with asphaltum varnish to yield the same rich black as the original. Patterns are created from digital scans the damaged glass to provide an excellent match of the contours that need to be replicated. Passé-parout cover glasses with gilt paint accents can be reproduced with two templates...one for the non-pareil line and the other for the window shape. The coverglass in the example at left was cracked and the black paint had deteriorated. 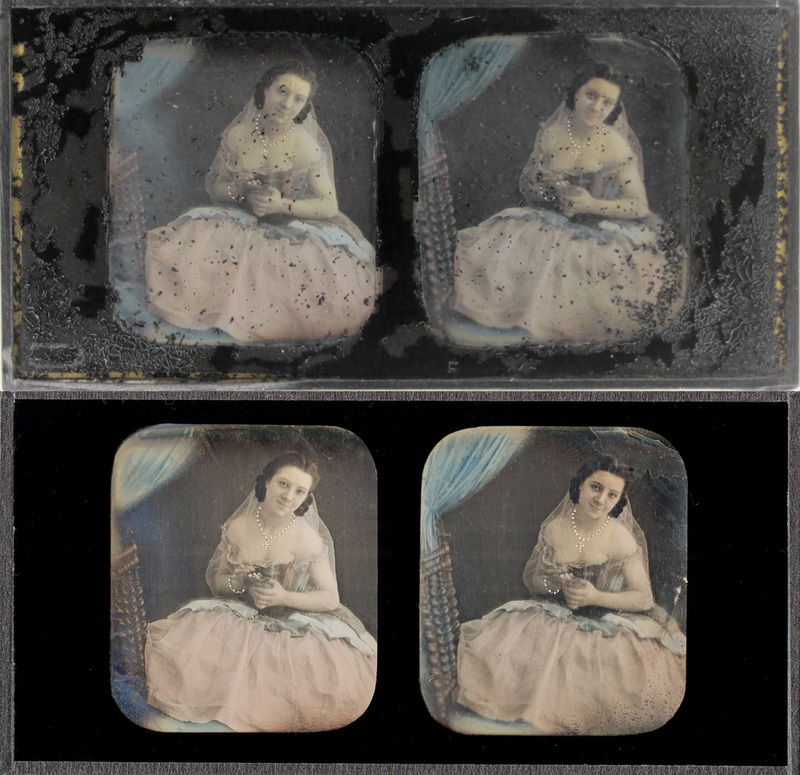 Furthermore, the plate package seal was severely damaged allowing for the ingress of atmospheric pollutants and moisture which necessitated conservation of the daguerreotype plate also. The plate was electro-cleaned and the housing re-assembled with a new replacement cover glass.